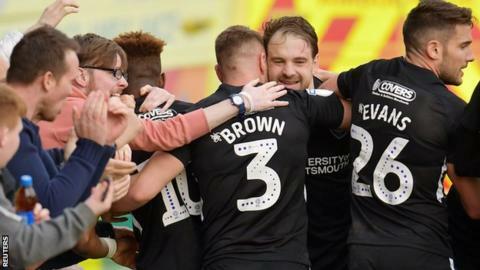 Promotion-chasing Portsmouth climbed to third in League One with victory at relegation-threatened Shrewsbury. Ben Close and Brett Pitman were on target at New Meadow to keep Pompey within sight of second-placed Barnsley against a Shrews side just a point clear of the bottom four. The home side started brightly, with Shaun Whalley's shot producing a fine save from former Town goalkeeper Craig MacGillivray low to his right. Whalley followed up soon after with an effort that was deflected narrowly wide before James Bolton headed over. Pompey then came into the game, with Jamal Lowe and Gareth Evans both denied by Shrewsbury goalkeeper Steve Arnold before they broke the deadlock in the 40th minute. Arnold initially kept out a shot from Lee Brown, only for Close to drill home the loose ball for his sixth goal in his last 10 matches. Substitute Oli Hawkins twice went close for the visitors in the second half, hitting the bar and then seeing a header impressively saved by Arnold. Town came close to equaliser when McGillivray superbly stopped a free-kick from Ollie Norburn, but it was Portsmouth who sealed the points in the 79th minute, with Pitman tucking home from close range a Hawkins left-wing cross. Match ends, Shrewsbury Town 0, Portsmouth 2. Second Half ends, Shrewsbury Town 0, Portsmouth 2. Attempt saved. Tyrese Campbell (Shrewsbury Town) header from the right side of the six yard box is saved in the top right corner. Corner, Shrewsbury Town. Conceded by Tom Naylor. Attempt blocked. Greg Docherty (Shrewsbury Town) right footed shot from the centre of the box is blocked. Jamal Lowe (Portsmouth) wins a free kick on the right wing. Foul by Ro-Shaun Williams (Shrewsbury Town). Oliver Hawkins (Portsmouth) wins a free kick in the attacking half. Foul by Omar Beckles (Shrewsbury Town). Attempt saved. Josh Laurent (Shrewsbury Town) right footed shot from outside the box is saved in the centre of the goal. Attempt missed. Shaun Whalley (Shrewsbury Town) right footed shot from the centre of the box is too high. Substitution, Portsmouth. Anton Walkes replaces Gareth Evans. Attempt missed. Lee Brown (Portsmouth) left footed shot from outside the box is too high from a direct free kick. Foul by Luke Waterfall (Shrewsbury Town). Oliver Hawkins (Portsmouth) wins a free kick in the defensive half. Foul by Shaun Whalley (Shrewsbury Town). Nathan Thompson (Portsmouth) wins a free kick in the attacking half. Substitution, Shrewsbury Town. Jonathan Mitchell replaces Steve Arnold because of an injury. Delay in match Steve Arnold (Shrewsbury Town) because of an injury. Foul by Scott Golbourne (Shrewsbury Town). Lee Brown (Portsmouth) is shown the yellow card for a bad foul. Goal! Shrewsbury Town 0, Portsmouth 2. Brett Pitman (Portsmouth) right footed shot from very close range to the bottom right corner. Assisted by Oliver Hawkins. Attempt missed. Jamal Lowe (Portsmouth) left footed shot from a difficult angle on the left is close, but misses to the left. Substitution, Shrewsbury Town. Josh Laurent replaces Anthony Grant. Attempt saved. Oliver Norburn (Shrewsbury Town) right footed shot from outside the box is saved in the bottom right corner. Christian Burgess (Portsmouth) is shown the yellow card for a bad foul. Shaun Whalley (Shrewsbury Town) wins a free kick in the defensive half. Foul by Christian Burgess (Portsmouth). Foul by Oliver Hawkins (Portsmouth). Luke Waterfall (Shrewsbury Town) wins a free kick in the attacking half. Anthony Grant (Shrewsbury Town) is shown the yellow card for a bad foul. Foul by Anthony Grant (Shrewsbury Town). Jamal Lowe (Portsmouth) wins a free kick in the defensive half. Tom Naylor (Portsmouth) wins a free kick in the defensive half. Substitution, Shrewsbury Town. Tyrese Campbell replaces James Bolton. Attempt missed. Ben Close (Portsmouth) header from the centre of the box misses to the left. Attempt saved. Oliver Hawkins (Portsmouth) header from very close range is saved in the bottom right corner. Attempt missed. James Bolton (Shrewsbury Town) header from very close range is just a bit too high following a corner.